Preface for LeftEast: On March 4th, Italy will vote for the general elections. In this interview, we reconstruct the political debate that is taking place in the country before that date. More specifically, we present an interview from the Italian on line journal Figure to Italian sociologist Francesca Coin from 7th of February 2018 that discusses Power to the People [in Italian, Potere al Popolo, PaP], a coalition of political groups including representatives from the “No Tav”, “No Tap”, “No Muos” and “No Triv” movement; “Clash City Workers”, Popular Front Italy, Revolutionary Pirate Movement and Eurostop, on top of involving political parties such as “The other Europe” and “The communist refoundation party”, PRC. 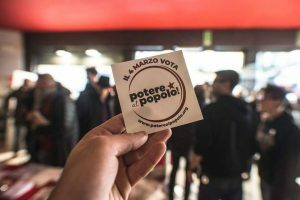 The political process towards the coalition was initiated by Ex OPG “Je so’ pazzo”, a social centre in Naples, on November 18th, 2017. In fall 2017, most of the political debate in Italy revolved around the need to construct a new force on the left that could represent an alternative to the Democratic Party. In those months, several activists worked on the “Brancaccio path”, an attempt to form a popular alliance between citizens and political forces committed to democracy and equality, and to build from the popular victory of the campaign of the referendum on December 4th, 2016. In those months, most left wing parties were committed to this process, first and foremost “Sinistra Italiana”, “Possibile”, “Mdp”, “Rifondazione Comunista” and “l’Altra Europa”. However, the assembly that was scheduled for November 18th at the Brancaccio Theatre was cancelled, as the “minimal conditions required to hold a democratic assembly had vanished”, wrote the organizers. In fact, the growing closeness of Possibile and Sinistra Italiana to the Movimento Democratico e Progressista (MDP) left bleak prospects for those who wished that the new alliance represented a real alternative given the presence of controversial figures who had traditionally played a vital role in the Democratic Party in MDP. It was at this point that PaP called for a general assembly on November 18th in order to start a new grassroots campaign that could represent a real option for the political left. In this interview, Figure opens up a debate on the “Power to the people” coalition, focusing on its program and political orientation. This is particularly important as the new coalition has been received in a polarised manner in the extra-parliamentary left, dividing the different political traditions. This debate is also particularly important given the growing influence of the right and the far right in the Italian political debate, a tendency made clear by the Macerata shooting, whereby a man who ran for office in the Northern League party, Luca Traini, went on a shooting rampage on February 3rd that wounded six migrants, and then performed the fascist salute upon his arrest. Thirty thousand protesters rallied in Macerata on Saturday, February 10th, despite the institutional attempts to ban the demonstration, to claim that the country is and will always be anti-fascist. By all evidence, a recomposition of the left in Italy could not be more urgent. Preface by Italian Journal Figure: In the upcoming weeks we will be publishing a series of interventions concerning Power to the People Party. Inside our editorial office there is an intense debate on the new political subject born in November from the proposal of the ex OPG in Naples. Some of us are more actively involved than others; in any case, the debate produced a series of questions, problems, and positive criticism in regards to a project that is difficult to understand in its complexity, particularly in relation to the present historical moment – in which all this is happening. Starting from the commitment of a few individuals and the doubts of all, we asked for contributions from some important figures of the Italian cultural scene, academics and non-academics, scientists and humanists, writers, sociologists, journalists, jurists … some politically engaged, others less so; supporters or critics of Power to the People; individuals that share a common set of values loosely called leftist. Many did not answer. We asked for an intervention that would argue the positive points, doubts, problems, and fundamental issues, the pros and cons of the project – in order to produce a critical discourse, at the time of an election campaign which is very reluctant to accept contradictions. The first question is very simple: do you know Power to the People? F.C. I have not directly followed the initiative Power to the People. I was abroad when the Brancaccio assembly was canceled and the founding assembly was called, so I could not follow this experience except through third parties (friends who are directly involved, or the media). My opinion is an indirect one, which only allowed me to have a grasp of some aspects of the trajectory out of which the project is born and what it aims to attain. Q The second question requires a somewhat more impressionistic response. It has to do with the name of the party and the two words in its composition. Power and People are now two obsolete terms in the discourse of the left in Italy. How do you rate the choice? F.C. Perhaps this is the most delicate question: the idea of “the people” is not only obsolete but also divisive, in this age, perhaps first of all in Italy. The concept of “the people” arises from the Hobbesian identification with the nation-state, and alludes to a kind of unique will that exists as a reflection of the state, “if the state, then the people,” wrote Virno in Grammar of the Multitude (2004). This “oneness,” in fact, is never given but exists in the collective imaginary and today it exists even more as an expression of nostalgia. Rivers of words have been spent on this and it in this context it is clear that the name of “power to the people” has been exposed to criticism. Above all from that part of the left that refers to the post-workerist tradition, it is clear that the concept of “the people”, so inseparable from the idea of ​​state, was seen as an anachronism imbued with nationalist residuals. On the other hand, it is also true that at present, the idea of ​​“State” has been seen, prematurely, by the same political tradition, as an obsolete concept, hence concealing an era in which, paradoxically, the dissolution of economic protectionism introduced by the free market was instrumental to the pursuit of national interests. We could not understand globalization without taking into account economic nationalism; this is the fundamental logical inversion, the principle that underlies most free trade treaties and the liberalization of capital movements. In this context, the quartet of freedom that marks the beginning of the neoliberal era, the free circulation of money, goods, services, and labor, can be understood as a consequence of the attempt to defend the proprietary order from the internal enemy, the working class of the seventies, by putting workers in competition across national borders, and from the external enemy, free capital. In this context, the era of globalisation could be interpreted as an outgrowth of economic nationalism, as exemplified by Volcker’s decision to defend US supremacy by increasing interest rates in 1979. In a sense, over the past four decades the notion of state was pushed out the door to come back from the window. The state as an agent of the redistribution of social wealth on the basis of the mechanisms imposed by the working class in the Fordist era was pushed out the window in a process that increased economic imbalances and sharpened inequalities between and within countries, hence transforming the erosion of the welfare state and the reduction aggregate demand into the instrument that allowed specific national interests especially in Northern Europe to erode the productive structure of entire countries and transform them into new market outlets. In this context, the idea of the dissolution of the state, let’s face it, clearly was a mistake. The overcoming of the state that part of the left hoped for was only given as a constant erosion of social securities and wages – as class violence, we can say. The state did not disappear, the welfare state was cut, the mechanisms of redistribution of wealth were constantly reduced, but the more this process took place and the more the repressive state and the police state returned, perfectly in line with the neoliberal discourse, and paradoxically, the more the welfare state underwent major cuts, the more the idea of “the people” gained political importance, intended as a nostalgic identity in charge of responding to the sharp awakening from neoliberal promises. In this context, the idea of “the people” is anything but given. I do not like the residuals of national identity underlying the use of the idea of “the people,” I do not think I’ve ever used the word in this sense and I don’t think I will. That said, it’s time we deal even with those social tendencies that we do not like. We know well how the right is using economic nostalgia to propose a new social order based on de-globalization, the restoration of nationalism, and racial hierarchy. All this was possible because the erosion of the welfare state pursued by the neo-liberal elites translated into an increase in poverty and economic violence that targeted the working class. In this context, “the people” will be all the more evoked as a political subject as we will be less and less able to protect the social body from economic violence, low wages, unpaid labor, informal work, the privatization of services, and so on. And this my point: wherein the right uses the idea of “the people” to evoke a nation state founded on racial hierarchy, Power to the People evokes this concept in a different sense. When I hear “power to the people” I don’t think we are saying power to the nation state, I think that what is being said is actually something different – we say power to the people and we mean power to the expropriated class, to exploited workers, to the social body raped by economic violence. Is it wrong? I have a hard time believing it. Q. Do you think that the term “people,” from a certain point of view, also serves to break the “media wall” at least in part, by exploiting the luck that the term brought to extreme Right rhetoric? F.C. I do not know if it manages to break the media wall, surely it tries to accelerate a process of social recomposition. We can disagree on the concept of “the people” if we look at it from the standpoint of the nation state, but the point with words is not limited to the meaning that they have acquired historically; in many cases words actualise the imagery that is projected onto them. It is evident that “power to the people,” in this sense, as an expression proposes, I do not know if it will succeed but it reflects an ambition to accelerate a process of social recomposition, to recompose an idea of “oneness” that may hold together a torn social fabric. “The people” at this stage represents a signifier for something that does not exist but which is strategically evoked in hope that such process can speed up the birth of the subject necessary to protect society against economic violence and to launch a counter-offensive – if we were to discuss the expression “power to the people,” I would start from here, from the perceived need to overthrow the extant balance of power because this seems to me a more constructive and less pretentious approach. Q. Let’s go back to Greece in 2015. In your opinion, how should a left that in recent years looked at what happened in 2015 consider the question of power? F.C. I am among those who suffered the most the contrast that was created in 2015 between pro and no Euro. I could also say that I disagree with both. The fundamental point is what exists in the premises of the current monetary union. Even in Italy – just think of the writings of Guido Carli – the monetary union arises from the need to use fixed exchange rates to quell the struggles of the seventies; to have, in short, an instrument of war against the ability to claim higher wages, labor rights, and to undermine the proprietary order. Fixed exchange rates should be understood as an instrument of wage restraint that transforms an exploitative agenda into an ineluctable necessity. In this sense, if we think of the construction of the monetary union as a form of violence from above that found consenting executors in the proprietary orders of the main European countries, then at that point going out or remaining within the monetary union becomes a secondary issue. The main issue becomes the relationship of power upon which the violence suffered by the precarious workers of all European countries depends. All this cannot be reduced to a pro-European or anti-European vision; both of them are short-sighted in my opinion. In the neoliberal era also the mobility of the labor force originated from the need to compensate for the economic imbalances produced by the free circulation of capital, I mean that the monetary union was never a project meant to increase transnational integration but has always been functional to the needs of capital and of the proprietary order. In the end, the complexity of the current situation cannot be dismissed simply. The resolution of the European question can only take place when the balance of power is reversed: only then will we have the possibility to change the conditions upon which depend the choices that are given to us. Since this condition is not given at the moment, the point becomes what to do to limit the suffering inflicted on the population. We should go back to reading Polanyi, today. The exit from fixed exchange rates has always depended on the fact that the population at some point no longer accepts to be used as a sacrificial victim of monetary stability. The time comes when pension cuts and job losses transform fixed exchange rates into the very embodiment of the enemy that must be overthrown at any cost. In this context, the worst thing that can be done in the face of this suffering is to liquidate it in the name of any moral vision of supranational unity. This is the mistake that the radical left has made in several cases. The fear of the right as a protective motive of the existing order is already an admission of defeat, and those who use the scarecrow of the right to legitimise the acceptance of new sacrifices and suffering, are destined to be their own main saboteur. The ideological preclusion against the idea of exiting the monetary union is, I must say, paradoxically, the worst enemy of the most convinced Europe supporters, because the impression, I’m not saying the fact, I’m saying the impression, is that they be willing to put the fear of right-wing populism before the suffering of the social body, placing themselves, with respect to this, in an external point of observation. The fact is that there is no nice and ready solution to the situation in which we are, nor has there ever been historically, in cases like this, because the balance of power is working against us, and paradoxically the right triumphs precisely because it seems able to offer a way out from the widespread perception of weakness. I’m not saying it’s good, of course, I’m saying that you do not get out of trouble by hiding your head in the sand, and the radical left during these years, I am sorry to say this, but the radical left in Italy at times has done predominately this, hide its head under the sand, in an attempt to protect a moral and ideological position that not only does not solve the problem but actually exacerbates it. In this sense, I say, there is no given solution and we must have the humility to consider all the possible scenarios and to discuss them openly first of all with those who live the current situation as something absolutely unsustainable. Q. What should be the degrees of continuity and discontinuity that Power to the People should propose with respect to the political experiences of the Italian left? F.C. I can only wish for discontinuity, both for the fact that there have been a number of failures behind us, but also because I hope for a change of phase. Someone thinks that in this situation of mild economic recovery there is still something to be hoped for or something to save, but I don’t think this is the case. The forces that preceded the emergence of this new coalition could still rely on a certain space of negotiation, Power to the People does not have that luxury. In this sense, it seems to embody a point of rupture. Once again, the point is not whether or not the conditions for a real rupture are fully developed, the fact is that the desire for rupture exists as a symbol of the need to mark a discontinuity with respect to the past, which is what I wish for PaP. Q. In order for these differences and elements of discontinuity with respect to past experiences to be constructive even after March 4, what are the possible mistakes to avoid after March 4? F.C. I was reading today a statement made by activists of Power to the People: “they ask us what kind of campaign we will be doing, but we are not doing anything different from what we did before,” they said. So ideally, even after March 4, nothing should change. We speak of a work that is very rooted in the social fabric, in the problems and needs of the population, in the need to give voice and give answers in a political way. In this sense, even more than the electoral outcome, it seems important to me that this agenda will continue and be consolidated in the territories. Q. One last question: what relationship should there be between a project like Power to the People and the intellectuals? Does it make sense to talk about intellectuals today, in relation to a political project? F.C. In my opinion, it does not make much sense to talk about intellectuals today, in the sense that in the last thirty years a good part of those who defined themselves as intellectuals set themselves as an explicit tool for the proprietary order and, ultimately, for economic power. Today’s academia for example, is full of mainstream economists rather than supporters of critical or heterodox positions, despite the 2007/8 crisis, which can be traced back to a certain type of intellectual essentially integrated into the dominant thought. Rather than intellectuals, I would speak of a widespread intellectuality, that is, of a generation – today’s generation – which is the most educated in history. So the figure of the intellectual per se, understood as a white male intellectual – because this was the classic intellectual figure of the twentieth century – is not something I like very much. At the same time, I realize that we need very specific skills, to get out of the mess we are in, on the legal level, on the economic level, at the level of social investigation, to name a few. In this sense, I do not see the need for a prominent intellectual figure; at the same time I think we need skills, and above all the ability to mix very technical skills with a good dose of courage and social sensitivity. 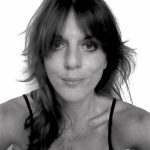 Francesca Coin is a lecturer in Sociology at Cà Foscari University of Venice, where she teaches Neoliberal Policies and Global Social Movements. Her research focuses on money, labor and subjectivity. She has published extensively on the evolution of precarious, unpaid and digital labor in a neoliberal society. She is currently working on a book on the relationship between the nature of money and social movements in the current European crisis.